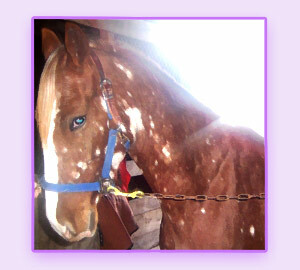 Paisley [ registered name: Toppers Cinnamon Girl ] is a half saddlebred / half appaloosa princess. I purchased her in December of 2002 after finally saving enough money to fulfill my dream of horse ownership. I had been planning on acquiring an Arabian/Pinto. However once I saw this mares pictures with all her lovely spots I could not imagine anyone else having her. [ Please note in the picture to the right that her eye is NOT really blue. ] I purchased Paisley from Brynja Henson of Dare to Dream Farm. Paisley is a real sweet heart and loves attention. All the mares in the field bite on her because they are jealous of her stunning good looks. 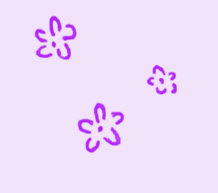 [ They are very ugly, boring mares I might add ]. Being half saddlebred Paisley can rack though I do not encourage it nor do I know how to ask her for the gait. I've never met a horse quite like Paisley in looks, or personality. She wants to please and she is a quick learner. Paisley's appaloosa pattern is called Snowflake. Meaning she has a dark background with white spots. I have been informed she is not eligible to be registered as an Appaloosa but I'm almost positive she can be registered a Walkaloosa. Her spots have changed dramatically since I've owned her. Check our her photograph gallery and notice the spots seem to migrate around her coat. If you are in need of pictures of a snowflake appaloosa please email me at ShugharHii@aol.com. Miss Paiso has now been to three shows with me and recieved ribbon(s) each time. I moved to Florida and ofcourse she came with. She is fat and happy. We are currently jumping 2'9" and she is being shown while I am in school by a 14 year old girl who rides at the barn I am boarding Paisley at. She has placed with this girl too.